I’m officially naming a facet of J’Adorn that has been a priority from the beginning. Meet J’Adorn Gives – an initiative straight from my heart! 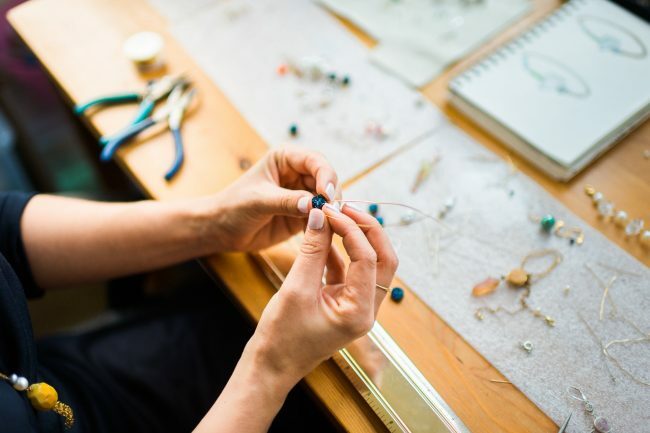 When I founded J’Adorn Designs to sell my handcrafted jewelry back in 2012, I knew that I’d have to reinvest every penny I made back into the business to keep growing. But I also knew that I wanted my company to be a force for good in the world. I wanted to make philanthropy part of my business model as soon as it was financially feasible. I had my first chance to give back through J’Adorn Designs in 2014. My hair stylist invited me to donate jewelry to her salon’s annual fundraiser for suicide awareness and prevention. This was especially close to my heart, as I had recently lost a childhood friend to suicide. So, I knew I needed to jump at this chance to make a difference. I made this custom jewelry set especially for the fundraiser. Then I designed the display and brought it to the salon for the silent auction. It made me so happy to finally be able to give with J’Adorn Designs! 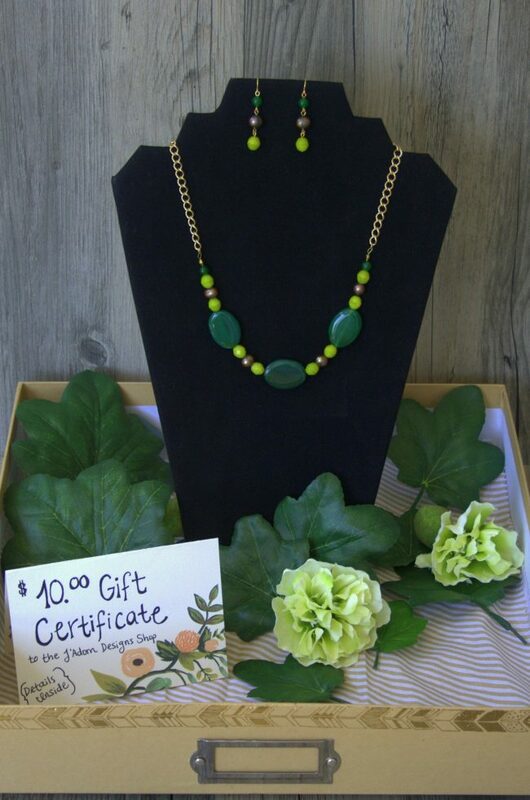 Since that first silent auction, J’Adorn Designs has donated jewelry or gift certificates to lots of other local, national, and international causes. 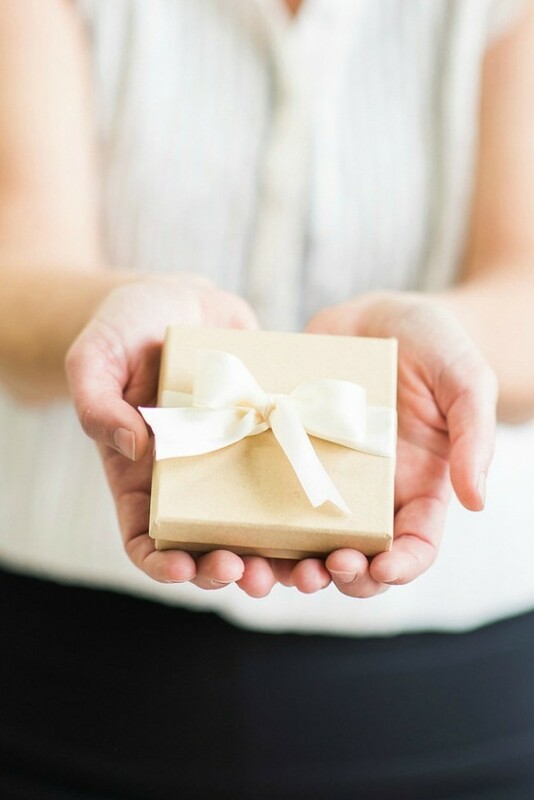 Philanthropy has always been a foundational value of my custom jewelry business. 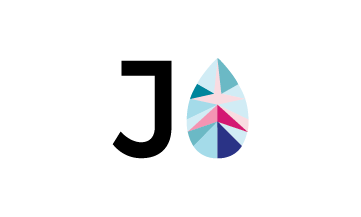 J’Adorn Gives is simply naming this priority. I hope you will join me in future endeavors to make the world a more beautiful place through J’Adorn Gives! You might remember J’Adorn bride Michelle from a previous blog post about her custom set of diamond and sapphire jewelry. 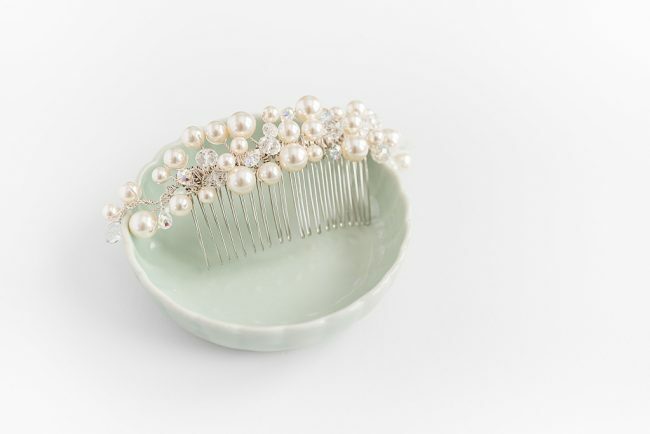 Today I’m sharing another piece from her custom bridal jewelry suite: a classic crystal and pearl bridal comb! 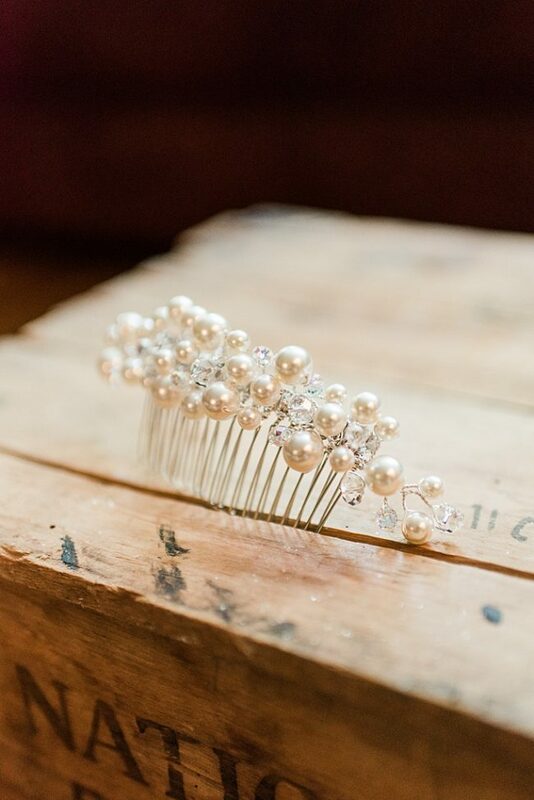 Michelle really liked the style of my Classic Crystal & Pearl Bridal Comb. But it wasn’t a perfect fit for her wedding colors and bridal hairstyle. So, I made some minor changes to the crystal & pearl colors to better match her look. Erica of Silver Immersion helped me customize the size of Michelle’s bridal comb at her bridal hair trial. 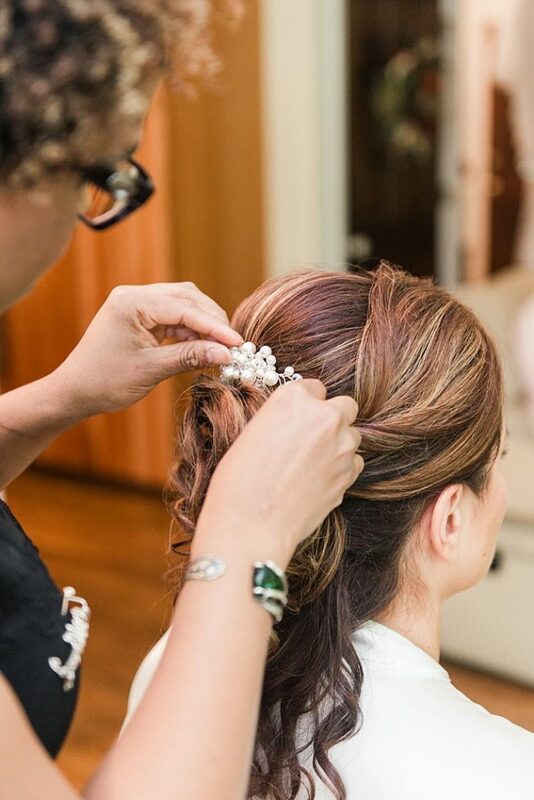 From there I designed a stunning, extra-long bridal comb that Erica could bend around Michelle’s cascading half-up bridal hairstyle. 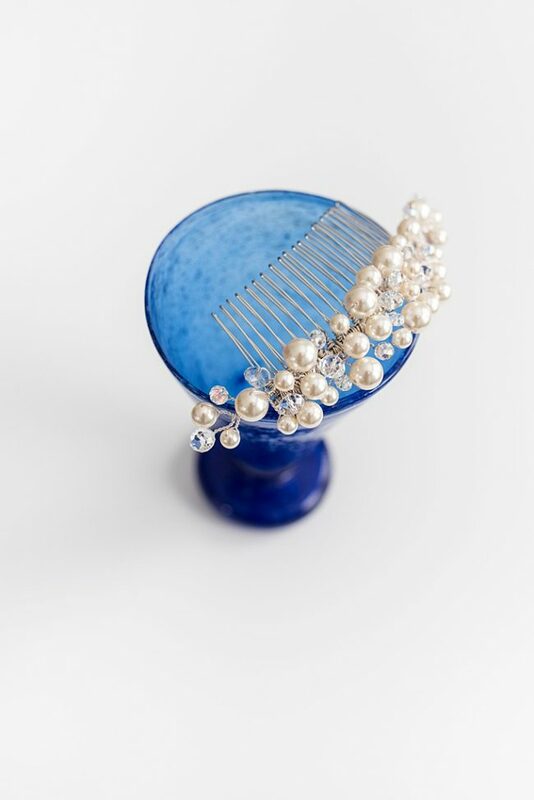 I created bendable crystal & pearl branches to extend on both sides of Michelle’s bridal comb. This made the design wider and even more stunning at the back of her bridal hairstyle. 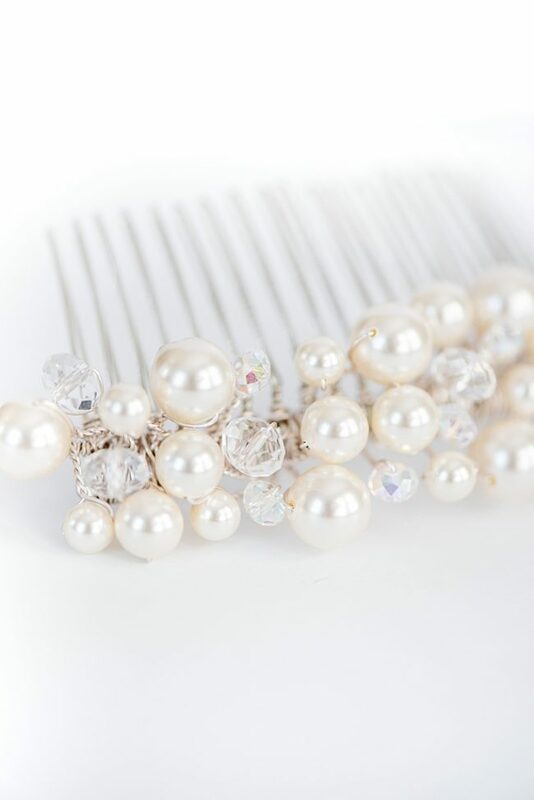 The end result was a crystal & pearl bridal comb in exactly the color, size, and style that this Maryland bride needed! 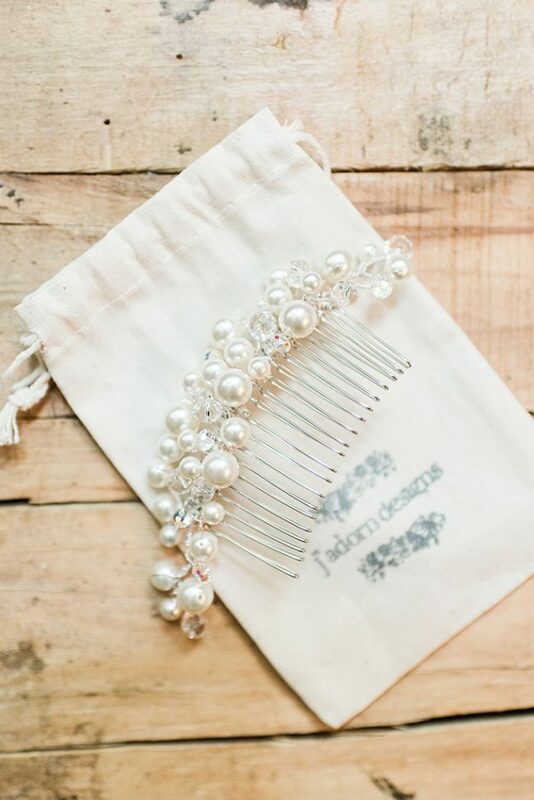 Are you interested in ordering a custom bridal hairpiece for your wedding? Send me a message to get started! 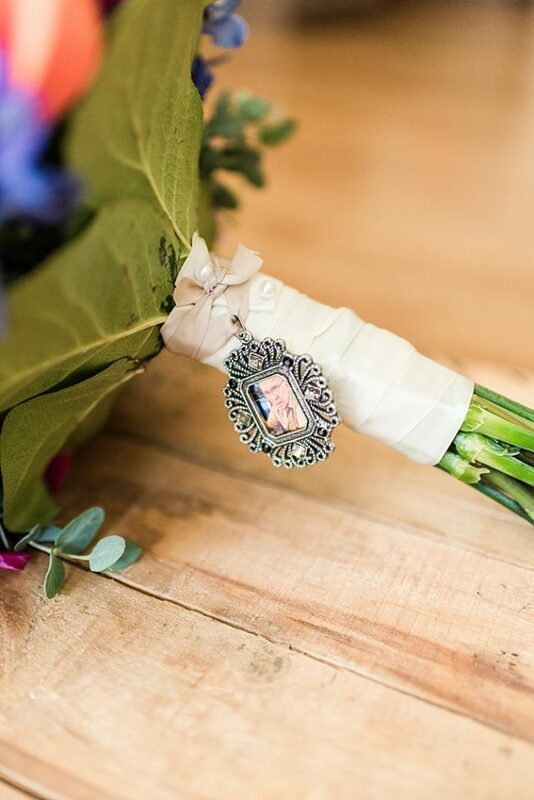 How do you honor the memory of a beloved parent at your wedding? This is the question one J’Adorn bride brought to me earlier this year. Michelle wanted to honor the memory of her father, whom she’d recently lost while she was planning her wedding. I had the idea to create a photo frame pendant for her bouquet to hold a picture of her dad during her walk down the aisle. She loved the idea! So I presented her with a few different frame pendant design options to choose from. 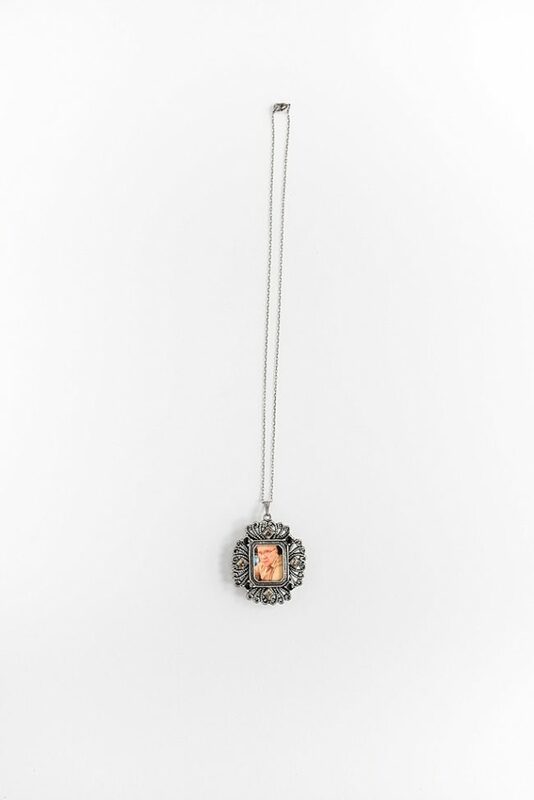 Michelle chose a frame pendant that had an antiqued silver color with black rhinestone accents. 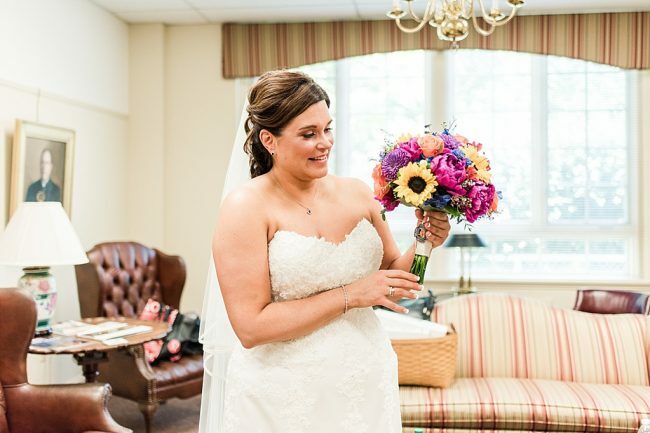 She loved the vintage look and it made the perfect accent to her bridal bouquet! Next, Michelle sent me her favorite photo of her father electronically. I had the picture printed professionally on the best paper available, then cut the print by hand to fit the frame pendant. 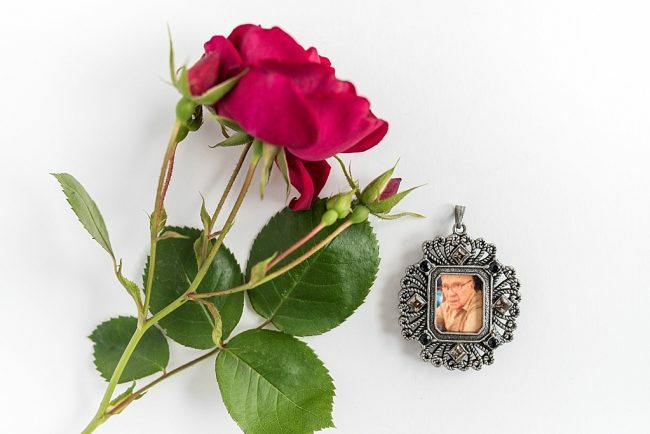 Because Michelle carries her father’s memory with her every day, I wanted to make sure this memorial frame pendant would be something she could wear after her wedding day. So, I provided a necklace chain for the frame pendant so she could wear it with other outfits long after her walk down the aisle. Michelle told me that she loved the final design of her memorial piece! She was thrilled to be able to have her father “walk her down the aisle” even though he couldn’t be physically present on her wedding day. And she looks forward to wearing the frame pendant necklace in the future to carry her father’s memory closely at all times. 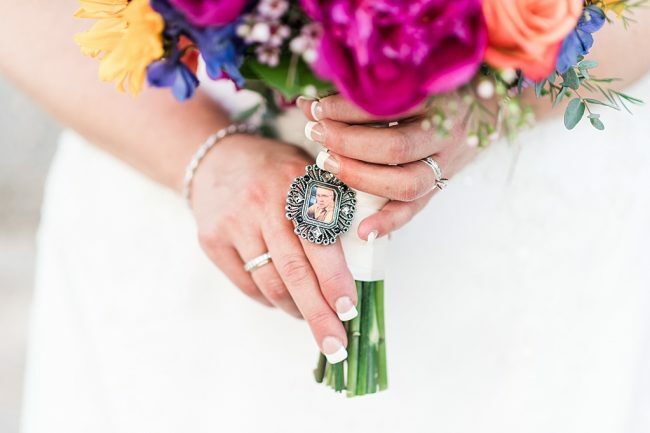 Would you like to commission a similar piece of jewelry for your wedding day, or simply to honor the memory of a loved one in your daily life? 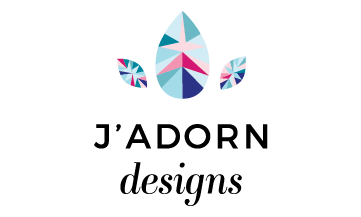 Send me a message to find out what options, including locket or frame pendant designs, are available through J’Adorn Designs! With fall wedding season in full swing, many of you brides-to-be are nearing the end of wedding planning mode with your big day just around the corner. YAY! You’re likely moving on to plan for what comes next – the honeymoon! 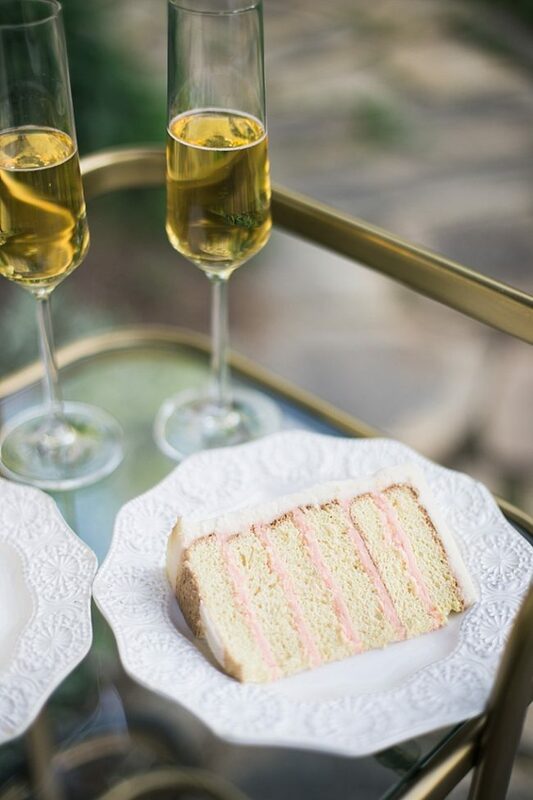 To help simplify the process for you, I’ve partnered with my fashion blogger pal / resident newlywed Carolyn Zerbonia of Lipstick & Chiffon to bring you a three part honeymoon style series. We’ll tell you how to pack for a variety of climates before you jet-set with you newly minted spouse. First on our list of climates is my personal favorite: the tropics! When packing for your tropical honeymoon, Carolyn recommends packing versatile pieces that you can wear with different outfits to help lighten your luggage. This is especially useful for packing shoes, which are often the heaviest pieces in your tropical wardrobe. 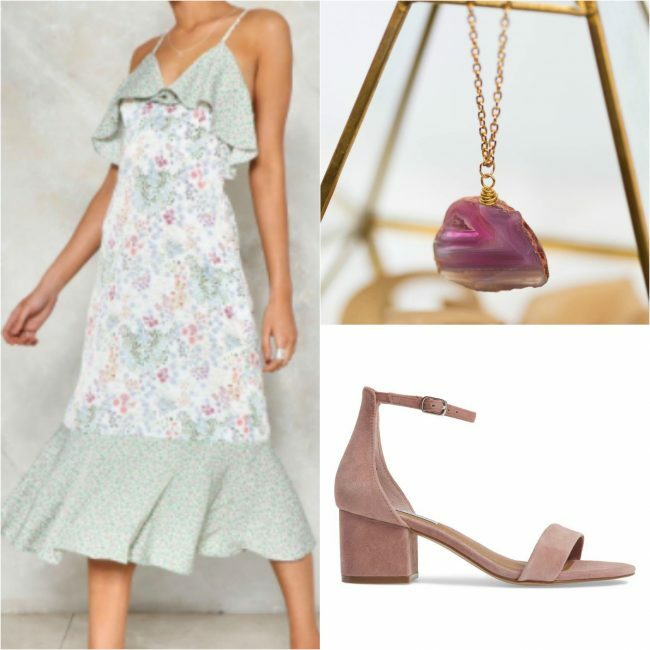 For instance, you can pair the same strappy heels with a couple of light, flowy dresses and your favorite gemstone statement jewelry. Try to pack pieces that can be mixed and matched to create multiple looks; this will help save space in your suitcase. An added bonus to packing light for your honeymoon? You’ll have more space to fit souvenirs on the flight home! If you’re honeymooning in a tropical climate, chances are you’ll be hitting the beach. A floral bikini with a lacy white cover-up is a stylish & romantic combination well-suited for a new bride. At night, dust off your sandals from the beach as you prepare for dinner. Pair the shoes with a beautiful white maxi dress and a pair of brightly colored statement earrings. You’ll be radiant as you look across the table at your new spouse, and comfortable enough to dance the night away! 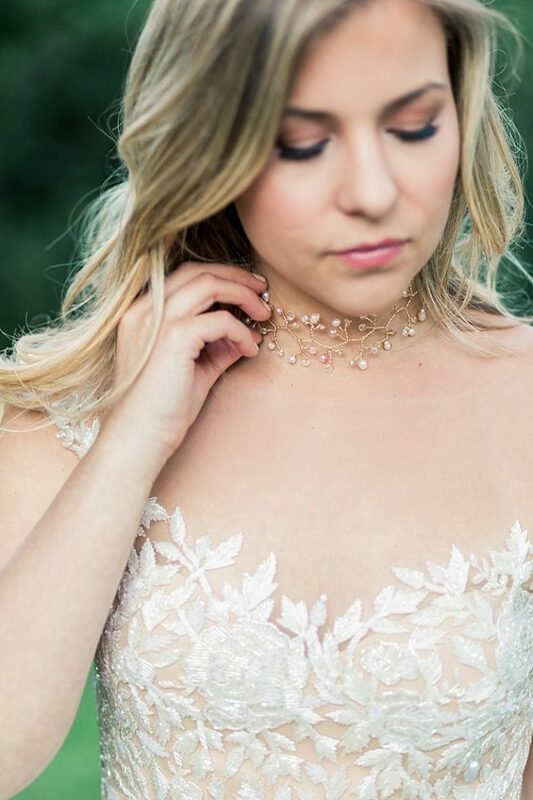 The set of delicate vine-inspired bridal accessories featured in this romantic bridal fashion photo session is full of peach, pink, ivory, and blush pearl accents intricately woven together. 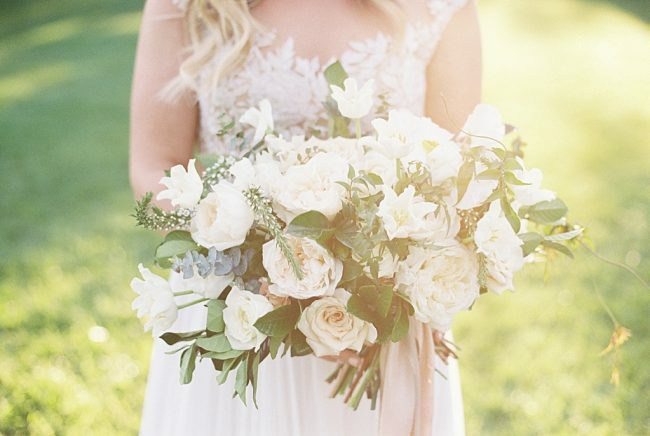 It was recently featured by Virginia Bride Magazine! So to celebrate, I’m sharing this gallery of my favorite images from the airy, intimately styled bridal portraits. Enjoy! 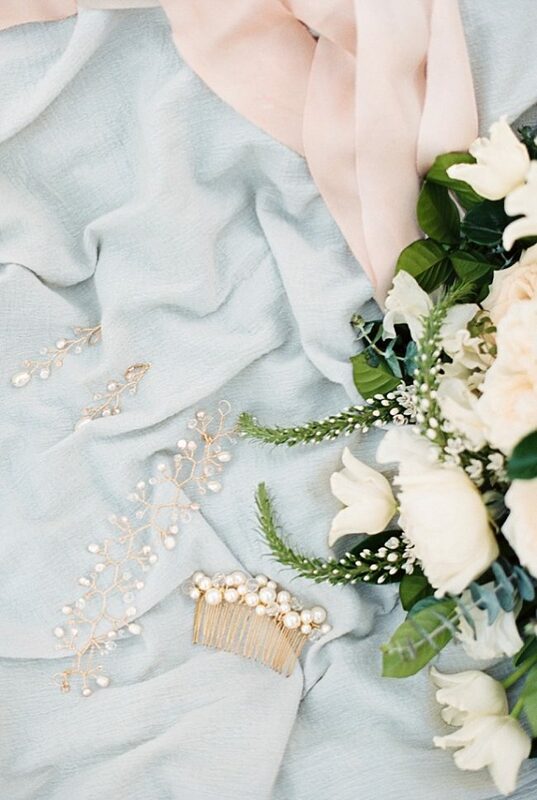 I love the interplay of tiny white buds from the bridal bouquet with the freshwater pearls in the vine-like jewelry set! 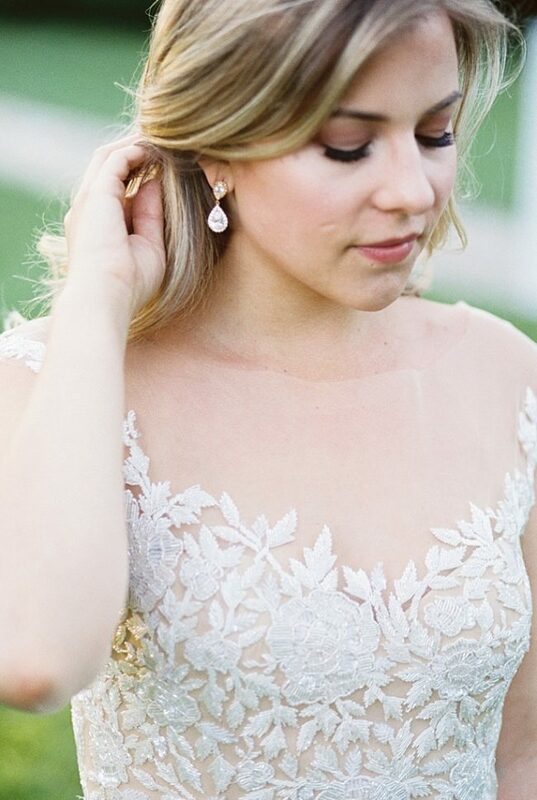 A pair of simple, geometric crystal earrings make the perfect accent for Libby’s loosely curled hair and intricately beaded bridal gown. 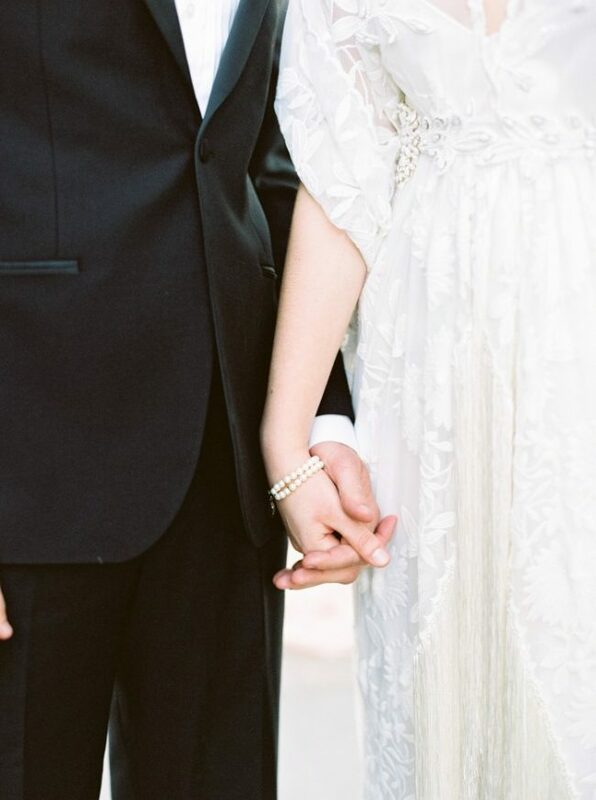 These are perhaps my two favorite parts of a wedding – besides the romantic bridal jewelry, of course! 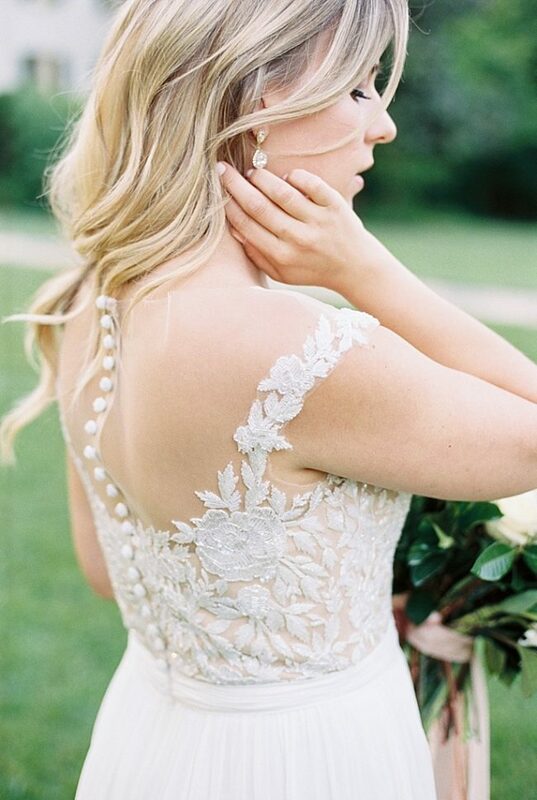 What’s your favorite part of Libby’s ethereal, romantic bridal look? Tell me in the comments!